The Art Predator is inspired by Coleridge’s definition of the aesthetic as that which engages the whole soul. 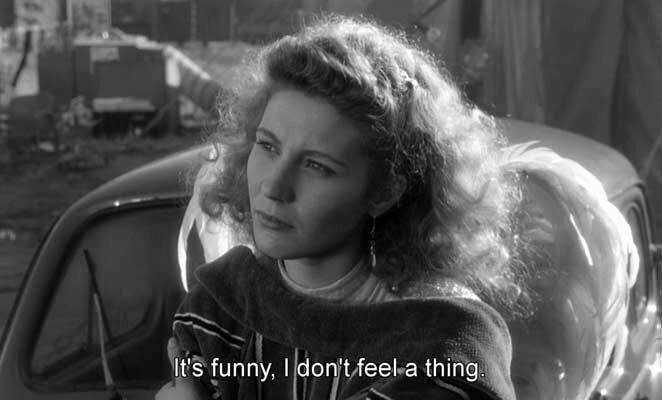 She also experiences this definition as a taunt, an admonition, and a slogan. If she were the type to get a tattoo, these letters might appear in random places. By way of background, the Art Predator blog developed out of a newspaper column. In addition to journalism, the Art Predator is a published poet and an exhibiting artist. For more about the Art Predator’s Artist Statement and CV, go here. Go here to see some of the Art Predator’s Broadsides & Videos. Go here to see a list of some Poetry Posts & Projects. Go here to see the Art Predator’s Greatest Hits. From 1996-2004, Gwendolyn Alley published three dozen poetry and art broadsides in ARTLIFE Limited Editions; several of these works are published also at http://www.art-life.com/. Alley has participated in the 3:15 experiment since 2001, and in 2007, she facilitated the Experiment . Many of her 3:15 Experiment poems can be found at http://315experiment.com/. In August 2008, Gwendolyn Alley began creating videos which combine spoken word, sound, and image. Her video poem “Shishilop Project” was accepted by GuerrillaReads for its September issue. Alley’s primary blog is the Art Predator: https://artpredator.wordpress.com; she also participates in the collaborative experimental poetry site, The Orchid Room, and she has several other blogs as well on various topics in different states of development. Her youtube channel is http://www.youtube.com/user/theartpredator. 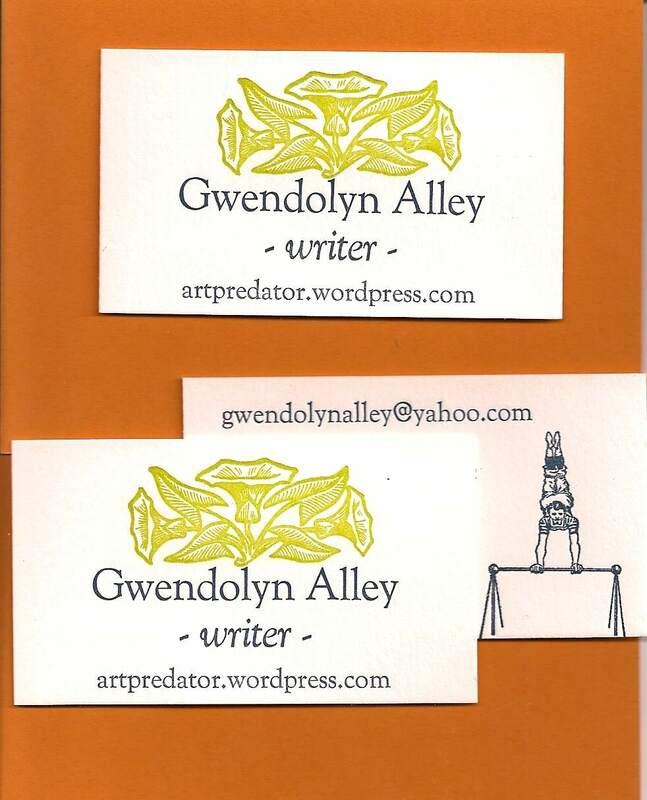 The eclectic Art Predator site includes many of Gwendolyn Alley’s ArtLife broadsides, 3:15 poems, an on-going collection of her own spoken word videos with music and images, as well as adventures in wine, travel, and song. Cool babanananas, am i aloud to say Coleridge was a musician but Byron was a Rockstar! I would have apologized – but no apology is in order. Any way – Hope you were not offended by it. just read about you…wanted to get an idea ‘who’ the ‘art predator’ really is! thanks for all your comments! Hey! Said I’d leave a comment. Probably comment on a couple other things as well. Thank you for spotting me in your poem — I sound like an odd answer-machine, beeping periodically. Thanks for leaving your story about your scar! I would love to hear more~ if it has affected in your life in any shape or form. Meanwhile, LOVE your blog- and the monkeys at Burning Man! i loved that piece (when i wasn’t getting creeped out by it). I think I’ll like it here too. Look forward to visiting. Will bookmark you. Thanks for the note on my blog. G’night, Burning Mama. Hey! Thanks for the comment on my blog (the post about e.e.cummings). You performed at Burning Man? My brother just got back from Burning Man. I was planning to go but couldn’t due to work obligations. Any way, You have a pretty cool blog here. Well, that is a prettier avatar. I could still see the shoes one as a book cover, it is a good attention absorber. i liked the shoes as well…fits in with on the move! but this one works better in the grand scheme of things–people can relate better to a face of a person than to the shoes! Caught a link to your blog off of Alpha Inventions. I know you from somehwere but I just can’t recall where. Damn. Must be pre-senility setting in. Rodger, you know me from one of my other blogs, http://whisperdownthewritealley.wordpress.com where i quoted you and a carver story and came around to your blog a few times. i was happy to see you on alphainventions–it reminded me i needed to go visit your blog more often! Thanks for the comment on my blog picture. My parents lived in Greece for four years; I went as often as I could. I envy you…former teacher who gave up everything for a dream. Keep it up. You are lucky and truly living. Hi! Thank you for your comment and concern on mumbai incident. You have a nice blog here. Keep up the good work. thank you, dinesh; i’m glad you like my blog. from the news it seems like it’s still chaotic over there but calming down. i’m sure there’s a lot of anxiety still. and visit every one else’s as well! it’s good for us to get out and read and comment on each other’s blogs, learn about the world through another’s eyes…thanks for checking out my world! Ah-ha! Now I rememeber who you are. Yes, you found th Carver poem “Your Dog Dies” through my aptly-named blog … Carver’s Dog. Nice poetry! One year or another , I’m going to make it to burning man if it kills me! Thanks for visiting my blog tonight. I love your fun and whimsical presentation and writing! Keep it up — we bloggers have to encourage each other, so I encourage you to keep sharing! Miriam Sagan is the author of over twenty books, including a memoir, Searching for a Mustard Seed : A Young Widow’s Unconventional Story (Winner best Memoir from Independent Publishers, 2004). Her poetry includes “Rag Trade”, “The Widow’s Coat”, and “The Art of Love”. Saw these, thought of you. I heard a rumor I was dangerous with words! No, no. Not me, though I’ve been known leave them about for people to trip over. Sorry about that. Can I shout you a beer? wow this girl is genius. Found your site by following my nose – happy serendipity. Have bookmarked it to come back often and check it out. Glad you’ve enjoyed the site, Elizabeth! Have you figured out where you will camp? I hope you’re close to Kidsville–please do come by! And I hope to find you too as well as your table! You’re welcome to set it up at our camp! Hi!! Hows life going on. Hey! I want to tell you one thing; I’ve launched my personal website. Please visit once.